The technology of ePublishing and eBook readers—and the market for their content—is swiftly accelerating, and reports indicate that ebooks for mobile devices are already in high demand. If you are a publisher who wants to get in on the action, QuarkXPress 9.1 is a great option for creating content for this medium. QuarkXPress 9.1, the latest version of Quark’s desktop publishing program, now offers the ability to design and create eBooks and eZines for the Apple iPad. That's in addition to the upgrade of its traditional layout and publishing tools, and its new authoring capability for the Blio Reader. Macworld has extensively detailed the new capabilities in the desktop publishing tool, which were immediately available upon launch of the program. The Blio Reader, while available for the iPad and the iPhone, still does not run on the Mac. Because of the limited scale of the desktop publishing enhancements, this review concentrates in large part on the most wide-ranging, indeed radical improvement of Quark XPress 9.1—App Studio. While Quark released version 9 in February, it was not until September that it released App Studio as part of the 9.1 upgrade. Thus, Macworld waited to review the app until all components were released to the public. In addition, because of the complexity of developing in App Studio (reinforced by the fact that Quark scheduled a Boot Camp devoted to teaching people how to use it), we decided to test the product by creating a genuine working app (one that will be for sale in the App Store) in order to offer readers a real-world evaluation of how well QuarkXPress 9.1 in general, and App Studio in particular, lives up to its claims. When creating an ePublication, you can design a vertical and horizontal version. QuarkXPress allows you to display both versions next to each other, copy elements from one layout to the other, and keep them in sync. There are two compelling elements to ePublishing: The business model is appealing, and designing for an interactive medium such as Apple's iOS devices is just pure fun. First, you design your app (bookstore or newsstand) and then create content (books or periodicals). In the past, the only self-publishing option for authors would have been a print-on-demand publisher. For a 40-page full-color book, for example, the final publication would cost about $10 retail with a 10 percent profit margin. The same book released as an eBook costs, say $1.99 to the reader, but the author is still left with $1.40 after Apple's 30 percent cut. So in theory, it looks like with ePublishing the author would break even sooner, particularly since there likely would be more interested buyers for the lower-priced eBook. But it’s not that clean cut. Authors can set the price for a print-on-demand book and thus increase the profit margin, without upfront publishing costs. With the Quark ePublishing model however, authors must pay a license fee for the application ($149) and an additional fee for each issue or book published ($349). All told, Quark fees total $498. The necessary Apple developer account fee is another $99. The Scroll Box lets you display a separate layout. Here it was used for a timeline. Users can swipe their fingers to scroll the story up or down. QuarkXPress 9.1 features a software module called App Studio Factory, which offers several options. You can choose between a bookstore, several kiosks, and a single-item app. These differ in terms of functionality and design customizability, so it’s important to choose wisely. With the standard bookstore for example, you can change the background and the navigational elements, but you can't add new buttons or functionality. To do that, you need to buy a license for the framework—which costs several thousand dollars. Thus, it is probably interesting only for larger companies. For the most part, the supplied templates should be sufficient, and with a little Photoshop work they can look quite distinctive. Unfortunately, you don't have access to the Photoshop files for the available templates. 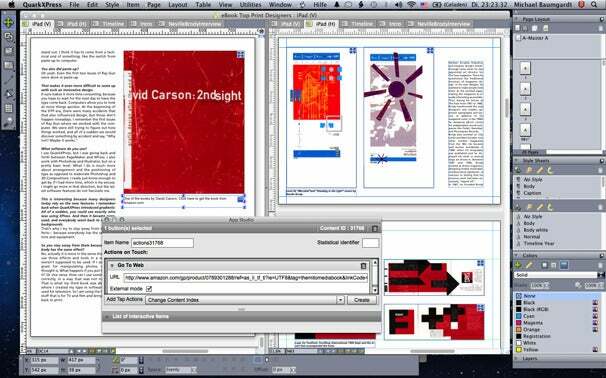 After customizing your bookstore or kiosk app, which you’d likely do only once, you need to create the actual publication in QuarkXPress. One tip: If you want to customize your bookstore, you can create the elements in Photoshop and save them as a PNG file. Then, drag them onto the objects that you want to replace in the App Studio Factory. You can link part of a page to a website. This can be used to link, for example, to Amazon.com, where readers can buy your book. 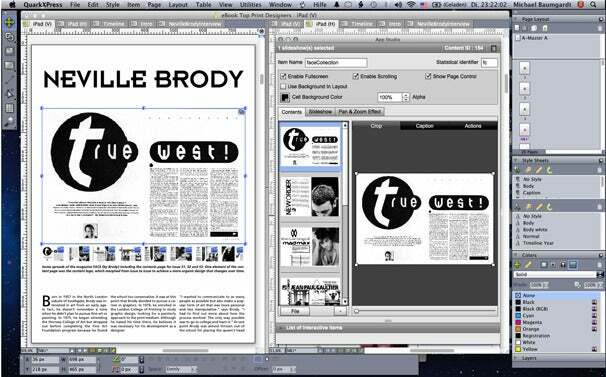 When creating your first book or magazine issue, there are two options: either convert an existing print layout or create an App Studio layout from scratch. The first option offers limited features and you wind up with something that closely resembles a PDF file. The reader would later navigate the pages by swiping up or down to turn pages, and left and right to switch between chapters or articles. Readers can also zoom in and out, and you can add various interactive elements, including slideshows, movies, buttons, sounds, and HTML via a new palette. It's more interesting however to create an App Studio issue because it allows even more interactivity. In the New Project dialog you can currently select only iPad as a format, but in the future you will be able to export to iPhone or Android, Quark says. After setting up your document in the App Studio format, you will notice that the document is displayed in both a vertical and horizontal layout simultaneously. Since iPad users can rotate their device, the layout needs to account for that, meaning you must lay out your pages twice. This is additional work, but it’s the fun part because you really get to experiment with your design and even create two completely different versions of your publication. To make things easier, you can copy elements from one layout to the other using the "Copy to other layout" command, which keeps content items in sync. You can style them independently, but the content of a text or image box is automatically updated. What is truly new are the interactive elements. Adding buttons, sounds, videos, or HTML pages is straightforward. Select a picture box and click on the element in the App Studio palette for further options. Buttons, for example, can have several assigned actions like Go to Web, Go to Page, Show Pop-Up, Show Fullscreen, and Change Content Index (which changes the content of another item on the page). When selecting a picture box and assigning a picture to it, you also have various options. The image can simply fill the screen when touched and you can add a caption displayed in a gray box over the image. Or you can assign a Pan & Zoom Effect, which will zoom the image in or out, like the Ken Burns effect. It is possible to create slideshows, including complex ones, with thumbnails. These effects make the design process both more interesting and more challenging. Most print designers are concerned with arranging elements on a page, but with this medium, you have to consider the whole process and the interactive user experience as a way to enhance storytelling. This would require a whole new way of creating that story and gathering the elements for it—more like scripting a movie. I am reminded of Blender, a CD-ROM magazine on pop-culture that did this years ago using Macromedia Director. With QuarkXPress however, the same process is seamless and much easier. Slideshows are another design element in which you simply select a picture box and either use a Simple Slideshow or one with thumbnails. You can determine the placement of the thumbnails (top, bottom, left, right) and then choose whether to display images or complete layouts. QuarkXPress can create several layouts in one document (called a Project) which is also the basis for the Scroll Box, a new design feature. When placing a picture box on the layout, you can designate it as the container for another layout. The new layout will show up as a tap at the top of your document window. Whatever you create in this linked layout will display in the scrollbox in your main layout. Later, when you export the magazine or book for preview, you will be able to swipe the layout in the scrollbox up and down or left and right with your fingers. Besides looking cool, it is a great way of hiding lengthy text in a small space. In the eBook I designed for this project—Masters of their Trade: Print Designers—I used this feature for a timeline of the history of desktop publishing. Instead of taking up several pages, which readers would have to skip through if they were not interested, it now makes for a nice little info box. But there is one more thing: it is possible to place markers in the scrollbox layout to trigger changes in other elements. After you have created your first book or issue, you can preview it on your iPad or in the program's iOS Simulator before publishing it to the iTunes store. Though publishing to Apple’s App Store sounds like a simple task, it is actually the most challenging aspect of this whole operation. Not because it is particularly difficult, but because there are quite a few steps involved and plenty of forms to fill out. Let's say it's about as much fun as filling out your tax return. 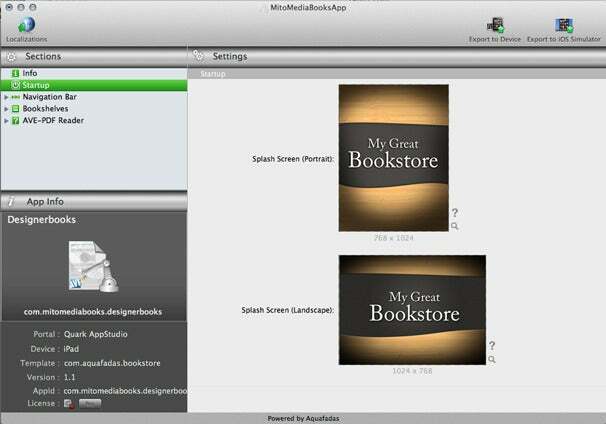 After selecting a type of bookstore or kiosk you can customize it. Assuming you want to publish to iTunes, I strongly recommend that you get an Apple Developer ID first. Even though you can preview the book or magazine issue in the iOS Simulator, you will need the Apple Developer ID anyway, so get that part over with before you head to Quark's App Studio website. After registering, you first create your collection, which could be a planned bookstore with several books, or a newsstand with several issues of one or more magazines. Creating the collection first lets you assign this collection to your App, which you set up in the App Specification. Unless you created a single publication app (in which case Apple will do the hosting within the app), you must upload your file (in .zave format) to your own server. Then export your publication from QuarkXPress with Layout (in .ave format), and use FTP to upload it. Finally, fill out the information in the Publishing section of the website, download your App Certificate from the Quark App Studio website, and import it into the App Studio Factory. Then, click on the Export to Simulator button to preview your work in the iOS Simulator (which you had to download and install beforehand from the Apple Developer website). Tweaking your own ePublication in the Simulator or on your iPad is gratifying. Note that you can get to this point without spending any money at all: you don't even need an Apple Developer ID to test your app. Only if you want to cash in on your creation would you need to buy application and publication licenses from Quark. After entering the codes in the App Studio Factory, you can then submit your publication to the iTunes store and envision your new media empire. What's new for print designers? 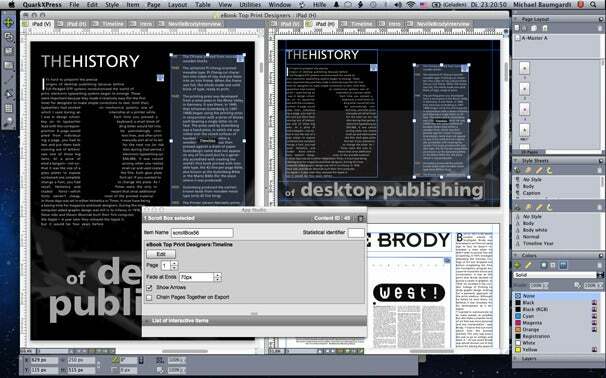 The major attraction of QuarkXPress 9.1 is its push into the ePublishing market via App Studio. Besides being able to create iPad Apps, you can also export to ePUB and Blio. ePUB is a free, open eBook standard designed for reflowable content. That means text and images reflow in much the same manner as on a Web page, adjusting to the available screen space. 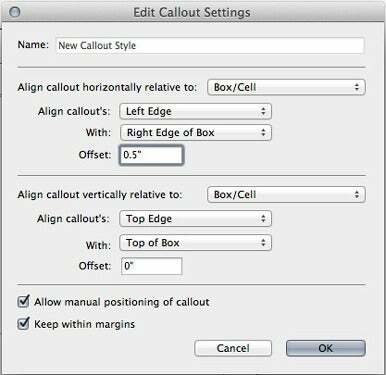 The Callout Settings offer pretty much everything you could ask for. Blio on the other hand is a free e-reader program by Ray Kurzweil, a major inventor well-known in the electronic music field who, among other things, has developed some extraordinary keyboards and samplers. The Blio e-reader comes with text-to-speech integration and other features that make it an interesting publishing platform. 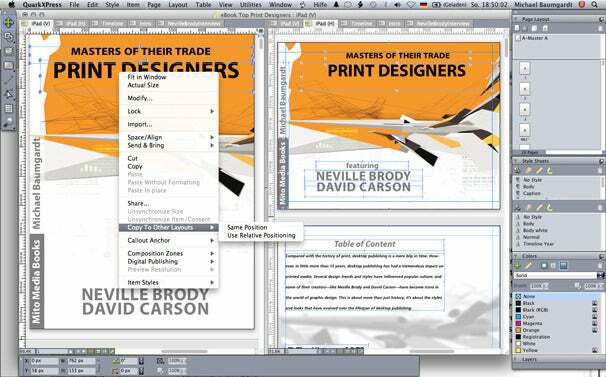 But with all the focus on ePublishing, you might ask whether QuarkXPress has something new for print designers. The short answer is: it does, but it won't necessarily rock your world. Some of the new features are great, but some have been available on other platforms for a long time. For example, Quark now features Conditional Styles—similar to InDesign's Nested Styles—which let you automatically style content based on styling rules. Conditional styles work elegantly as long as your text has a regular structure. Setting up Conditional Styles is simple enough: You just open the palette and set up the conditions, such as "Apply style XYZ up to the first two words, then use another style format," or something similar.